Adoption is central to maximizing your analytics ROI. Captivate your audiences with a web portal that marries interactive data visualizations with team-generated insights and delivers both via mobile-friendly emails. A polished analytics portal with interactive Tableau vizes, editorial workflow, flexible content hierarchies and unified search. Attract reader attention with mobile-friendly emails with inline images. Newsletters summarize and link to recent stories. Engage readers by easily weaving together rich interactive content sourced from Tableau, Excel, PowerPoint, web pages, and more. Reduce amount of time and effort required. Easily combine Tableau vizes from multiple workbooks and narrative into templates and instantly schedule distribution across your analytics team and into your organization. Combine narrative and vizes from multiple workbooks in reusable templates. Set filters across all workbooks with a single story tag. Business authors easily combine, embed and customize existing vizes without needing Tableau skills or Tableau Desktop. Author rich, multimedia, interactive stories for the web, then easily export to PDF, Powerpoint, or Word. Timely data and insights are more actionable. Turn your existing vizes into a news feed. 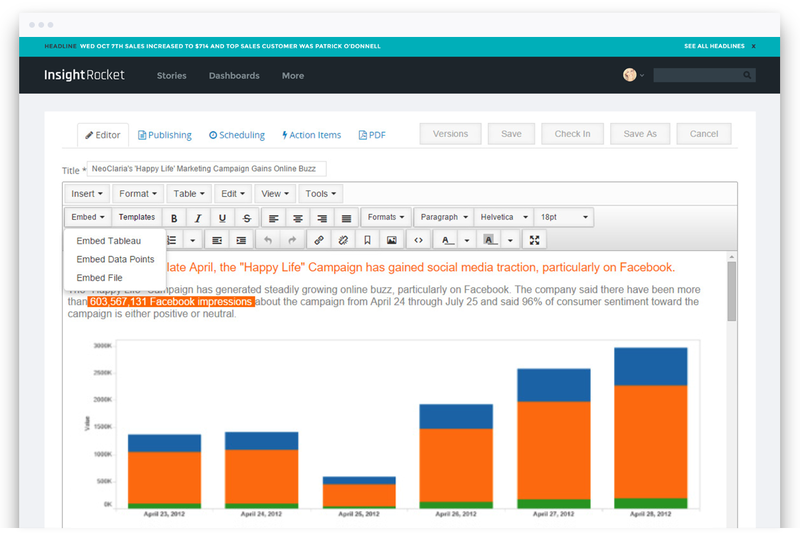 Automate dynamic stories based on thresholds on any Tableau-sourced data. Deliver fresh headlines via email with links to interactive content. Schedule publication to the web or email, conditional on data availability or thresholds. Optionally first send to editors for review and improvement. Dynamic data sourced from any Tableau worksheet, inserted anywhere within your narrative. Interactive vizes and other content dynamically included based on thresholds. Dynamically created headlines published when data conditions are met and including your latest data. Visible on the portal or via email subscription. Create a metrics-driven culture. Expand storytellers beyond Tableau developers to include business analysts. Expand your audience through timely, rich, business-oriented stories delivered via web and email. No need for Tableau Desktop or training. Easily tell stories including interactive vizes via an intuitive blogging interface. Story-level checkout and access control. Optionally share authorship by role. Version compare and restore. One-click inline emails to colleagues of modified vizes. Email recipients can interact from where the sender left off. 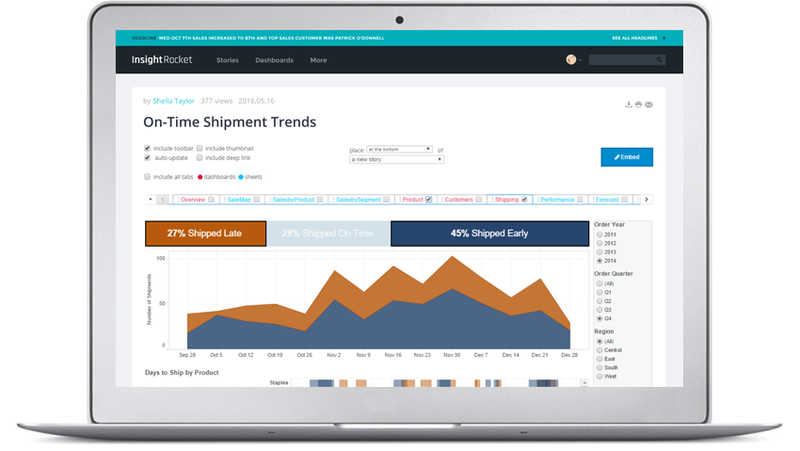 Enable team members without Tableau skills to tell interactive, data-driven reports and stories. Instantly publish stories to the web, mobile-friendly emails, PDFs, Word and PowerPoint. 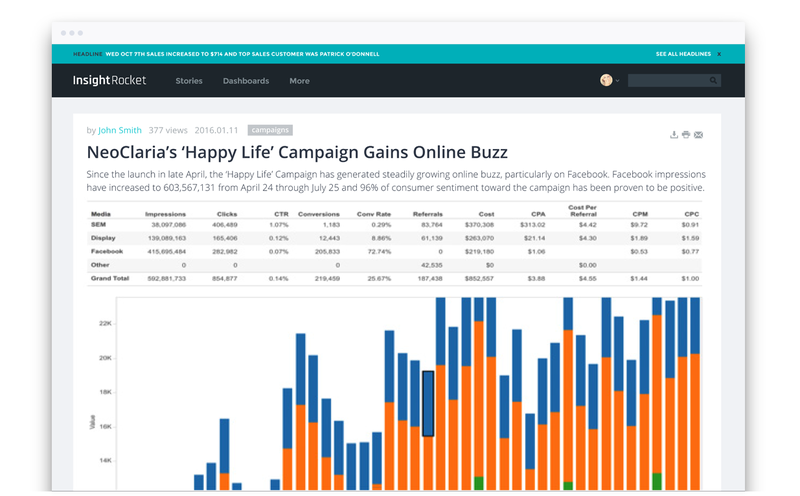 Embed dynamic data points from Tableau visualizations anywhere within your narrative. 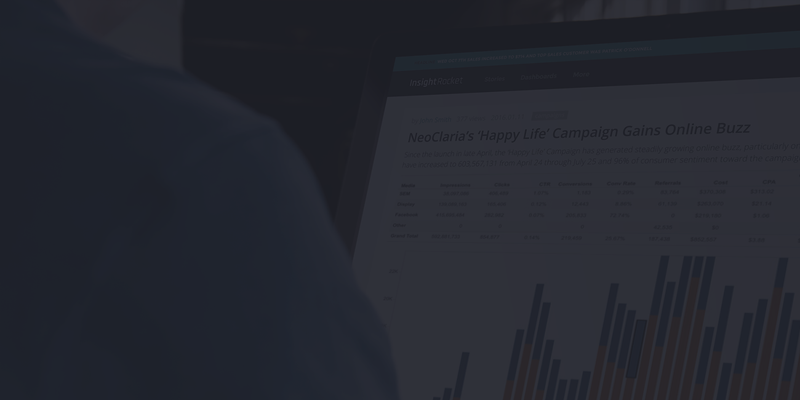 Expand your analytics audience with executive portals, newsletters and headlines. 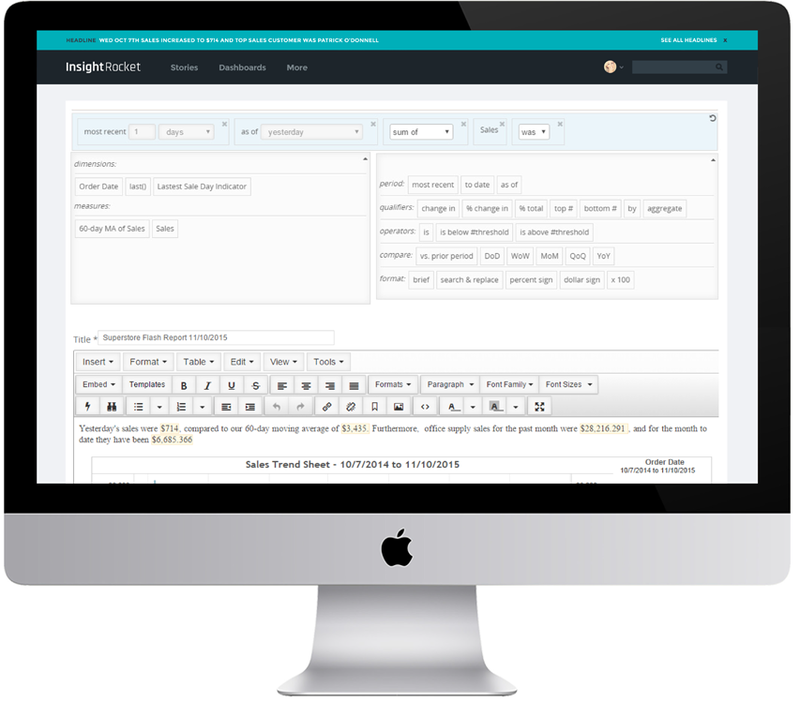 Save time with automated stories and reports that vary based on flexible data thresholds. Encourage dialogue and collaboration with email-based commenting, ratings, and more. Easily weave together text, interactive vizes, images and non-Tableau content into a story.